You are here: Home » Back to Boston! It has been a little bit since I have blogged as things have been busy so this will be a bit of a catch all post. After the Maccabiah Games I needed a bit of down time which did not fit well with an upcoming marathon but the goal was simply to quality for Boston but with a training plan that had no run over 15 miles and peaking 5 weeks before a marathon I was not exactly going in a marathon well trained. The Via Marathon was September 8th and it was the last possible day to get a qualifying time before the Boston Marathon registration period opened. Therefore my goal for the race was two fold. First, not crush my legs and blow up. I have XC races this fall that I am focusing on. Second, get a BQ-20 if possible but be smart enough to back off early enough if that feels like it will leave me with a long recovery. 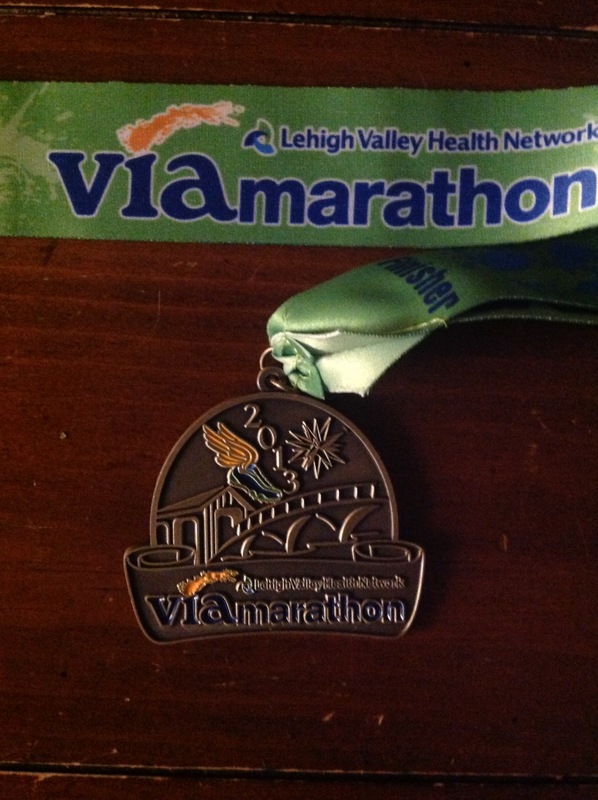 I went to the Via Marathon with Tom Beerbower. 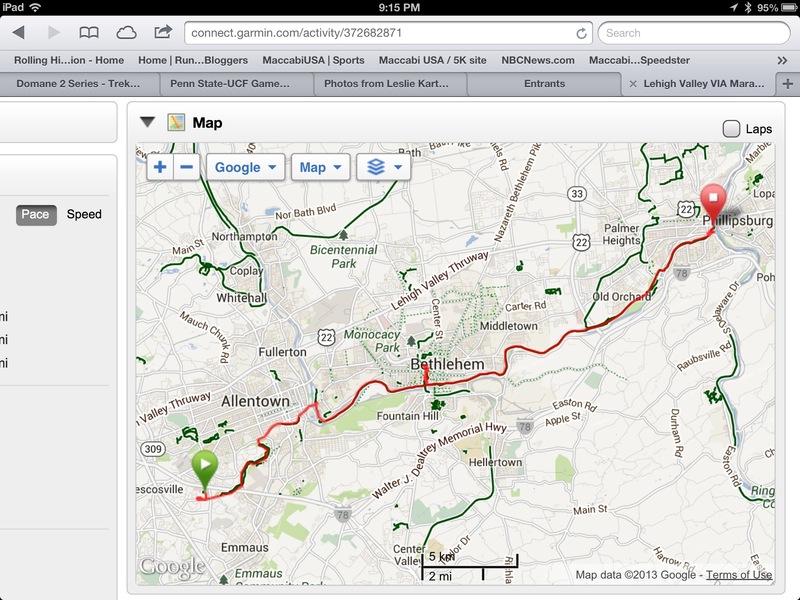 The race was in the Allentown area so not too far of a drive. Tom was kind enough to pick up my number the day before and to drive race morning. The gun went off at 7:00 and we left at 4:30am. We made great time and got their well before 6 so we had plenty of time. It was strange as I didn’t feel nervous. Quite frankly if didn’t feel like a race. It felt more like a training run. After waiting for a while and hitting the porta johns a few times Tom and I went to the starting area. He was looking to run a bit slower than I was so he lined up just a bit behind me. I found Joe Haughey, who I coached when he was in high school about 10 years ago. He was looking to run about what I was so we started out together. 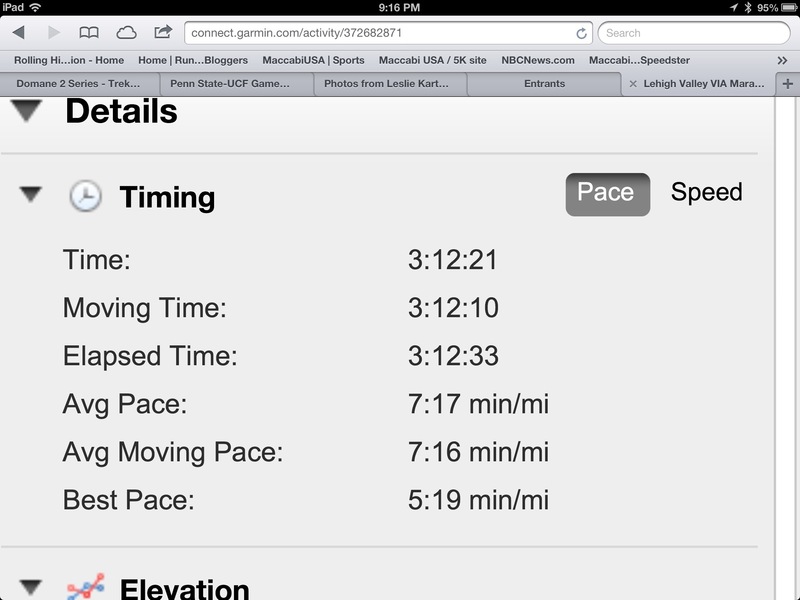 Basically I was running between 6:40 and 6:50 per mile. I told myself to run that as long as it felt easy but as soon as it felt like I was pressing to back it off. 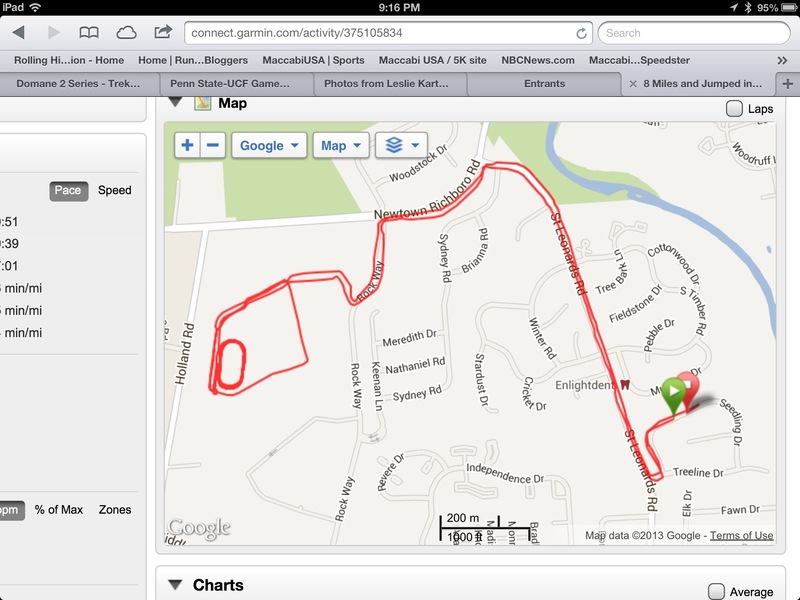 I held pace for about 17 miles and at that point felt I needed to back off. Had I been training for a marathon, I would have pushed through as I usually feel like junk from 17-20 and then, if it is a good day, feel better. That said, to push through would have left me flat for 6 weeks or so and I was hoping to get right back into training so I backed off. It is funny, whether I run easy or not the last few miles never feel good. I took the last 10K relaxed as I knew I has BQ-10 in the bag and BQ-20 was possible but not worth trashing my legs. So I just relaxed and even stopped to get both water and Gatorade at on of the fluid stops. I crossed the line in 3:12 and got some water and decided to wait for Tom. This was much of a wait and Tom ran about 3:18 also getting his BQ!! Then the day got strange. I started feeling sick and began to throw up just like I did after the Maccabiah half. So to the med tent to get the IV. The gave me zofran to stop the puking and I felt much better. I am not sure why this keeps happening as I thought I hydrated well during the race but I need to review as I really did not push myself that hard yet still had nausea that stated well after I finished. The med tent delay ended up becoming a much bigger delay as there was only one shuttle bus back to the start. Luckily Tom was happy to sip some beer while waiting for me to leave the med tent and use my beer ticket too! 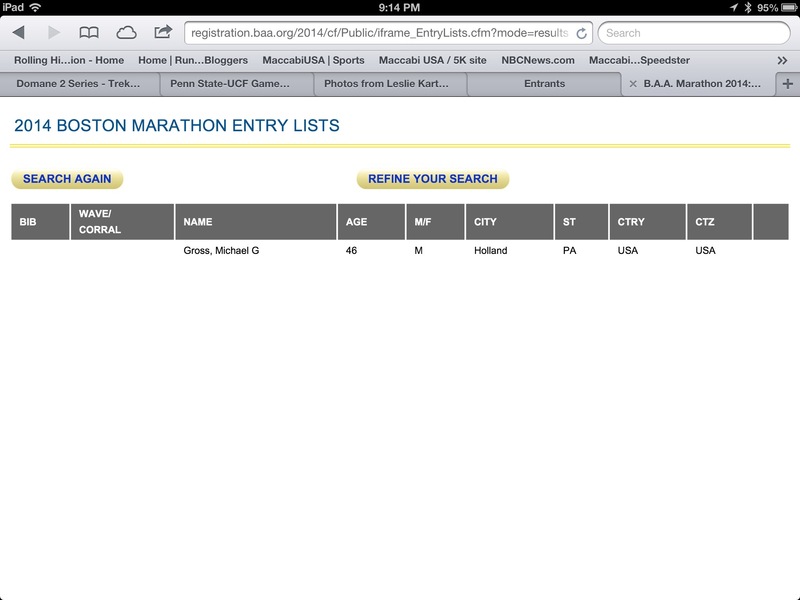 At the end of the day I got my BQ-10 and on Wednesday I registered and got into Boston! 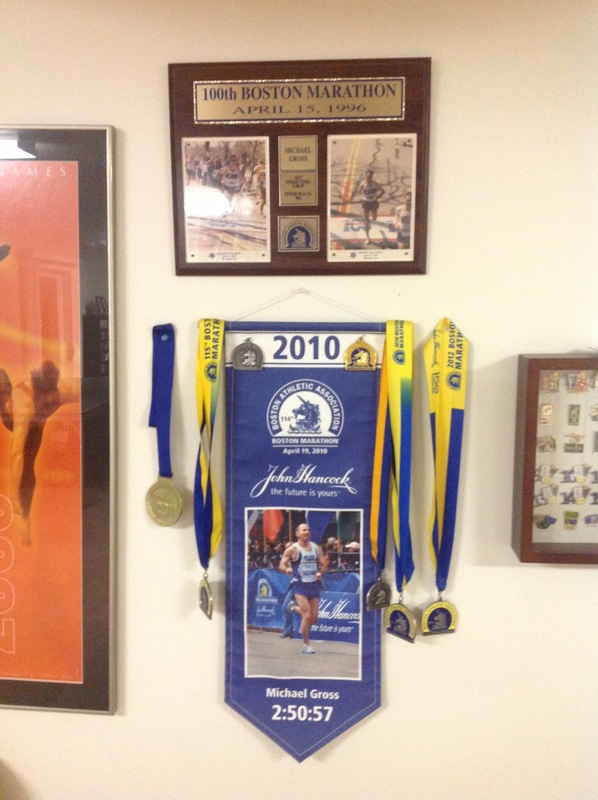 I have run Boston many times but last year, although I registered, I chose not to run as I was training for the Maccabiah Half Marathon and a marathon did not fit the training. After the tragic events that happened at Boston, I told myself I needed to go back to STAND UP and not give in to those who tried to take away our freedom. I will be proud to be in Boston with my family this April!! What is also cool is that one of my wife’s friends also qualified at the Via Marathon so we will hopefully spend some time with her and her family in Boston as well. 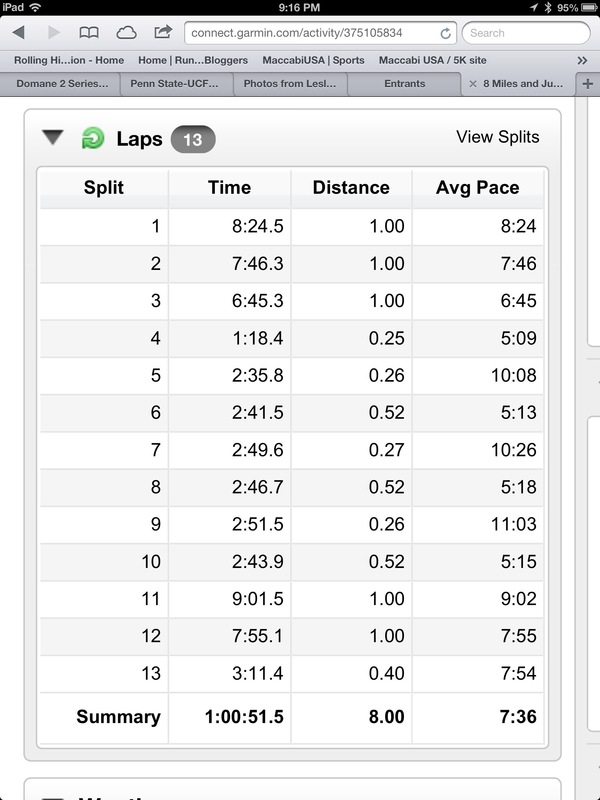 The rest of this week I had planned to get in some easier runs to let the legs recover. On Friday I planned a late day run as I had traveled back from Pittsfield MA. On the run I planned to drop of a few items to the XC coach at CR South, my good friend Joe Warwick. He had the kids running 800m repeats so after running to the school I jumped in with them. That was humbling as my legs were still shot. I ran 4 800m repeats in roughly 2:40. I then ran home. I took Saturday off as that is the Yom Kippur holiday for those of us who are jewish. We fast on that day so it made sense to use this day as my off day. It was nice to have a day thinking about other things with my family. Tomorrow I will be getting in an early long run and then back to full training. Back to focus on a few fall XC races and then the focus will shift to training for Boston. I will be starting further back that I am used to but if I use that to keep me controlled early I still should be able to break 3 hours which will be my goal. Lot’s to look forward to! Wow. Congratulations. My son missed his BQ by 3 minutes. I missed mine also. Way to go. It was a fun race.